-- My name is William Kensey. I have a wife and two great kids. Until very recently, I was a well-respected and financially successful trial attorney. I was also a man who was comfortable with his religion. I preferred it served at arm's length from the pulpit on Sunday morning. And would rather not discuss it the rest of the week. 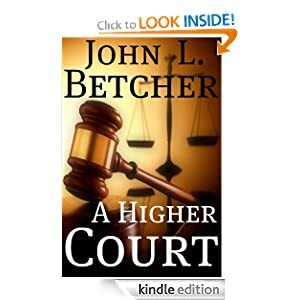 The circumstances that led me to write A HIGHER COURT changed all that. The entire experience was both bizarre and unavoidable. You see, I was summoned to serve as a juror in an improbable trial -- a trial to determine whether God exists. You think that sounds ludicrous. I did, too . . . until the trial began. Witnesses buried me under mountains of scientific evidence. My own eyes forced me to confront the reality of extreme human suffering. God seemed less and less relevant -- even absent -- as the trial progressed. At the close of the trial, I had to render my verdict -- "God" or "No God." Affirm a new and deeper faith in a Creator, or confess the triumph of science. A HIGHER COURT is the story of how I discovered my ultimate truth. If your mind is open, you can join me in this journey of self-discovery. Come along. You won't be sorry. -- David Chance can see messages in the sea of words around him, messages that warn him of future events. Words are everywhere -- on labels, magazines, sign posts, t-shirts -- everywhere. And as much as David Chance would like to hide from them, he can't. Words keep leaping off objects around him, forming messages in his mind. But how is this possible? Has his brain suddenly taken an evolutionary leap forward, or are the mysterious messages proof of divine intervention? 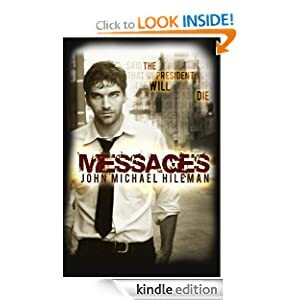 Driven to answer a question he'd long ago abandoned, and stalked by the killer he's trying to stop, David risks everything to follow the messages to a dirty bomb set to go off in the heart of Boston. But can he trust the author of the messages to protect him from a terrorist who seems to know his every move. 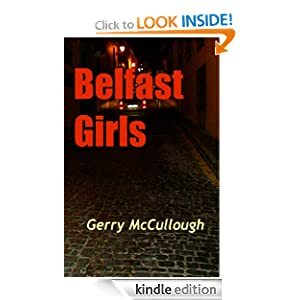 -- The story of three girls - Sheila, Phil and Mary - growing up into the new emerging post-conflict Belfast of money, drugs, high fashion and crime; and of their lives and loves. Sheila, a supermodel, is kidnapped. Phil is sent to prison. Mary, surviving a drug overdose, has a spiritual awakening. John Branagh, former candidate for the priesthood, a modern Darcy, someone to love or hate. Will he and Sheila ever get together? Davy Hagan, drug dealer, ‘mad, bad and dangerous to know’. Is Phil also mad to have anything to do with him? Although from different religious backgrounds, starting off as childhood friends, the girls manage to hold on to that friendship in spite of everything. -- Victoria is thankful for a lot of things- Joshua, the love of her life, a career change that starts a new chapter, and a condo in the suburbs of Chicago Illinois. Her jaw drops when she opens the garage and finds a brand new Cadillac wrapped in a huge bow. She is ecstatic and ready for the next steps towards her future. This is Victoria’s fresh beginning. When Victoria and Joshua start their journey things take a turn for the worse. Victoria finds out that her nemesis and Joshua’s ex, Danielle Shumaker has flown to Chicago to try to get Joshua back. 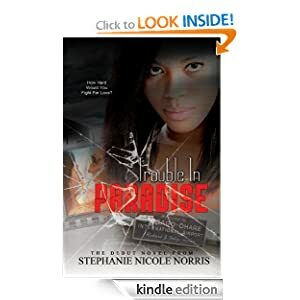 Victoria is determined to win this fight, when she finds out Joshua has secrets of his own. Distraught, confused, and mad as hell she falls into the arms of another. When emotions run high and desire digs deep Victoria finds herself caught up in Trouble. -- It was a time of abundant, noisy blessings for Emily Cook. Five children, age 5 and younger, energetically consumed her food, her time, and her heart. Then, in the fall of 2008, this loud and happy life was shattered by a deafening silence. Bouncy four-year-old Aggie was stopped in her tracks by a seizure--It was to be the first of many. This story includes no clichés or easy answers, and it is not an attempt to answer complicated questions of human suffering. Rather, it is a demonstration of God's faithfulness toward one sick child and her imperfect mother: both weak, but both loved. Aggie had a brain tumor that disrupted her young life; her mother’s sin and selfishness disrupted her best attempts to care for her. 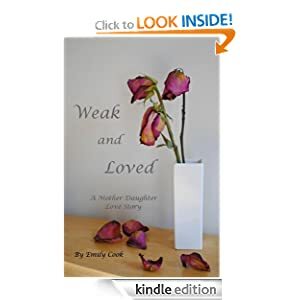 Written from the perspective of a mother who suffers with her child, Weak and Loved allows readers to experience the struggles of faith and encouragement of God. Readers will enter the difficult, earthy, and sometimes humorous world of a sick child, and be pleased to find the beauty of God's love in Christ even there.